Kim said that his relationship with Xi has a “comradely trust” and that he looks forward to continuing to work together. 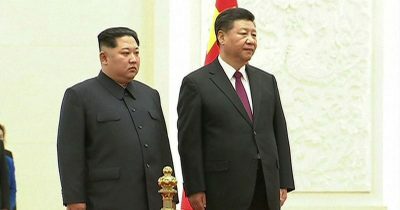 Chinese President Xi Jinping held a meeting with North Korean leader Kim Jong Un in Dalian, China on Monday and Tuesday. The two leaders, along with several officials from each country, held a luncheon and discussed pressing issues on China-North Korea relations. According to China’s Xinhua News Agency, the leaders’ discussion focused on regional peace, economic development and strategies for realizing long-lasting peace on the Korean Peninsula. Xi said he “speaks highly” of the two country’s growing relations. The meeting was the second in less than two months; late last March the two leaders held a meeting in Beijing, preceding the upcoming landmark intra-Korea summit between Kim and his South Korean counterpart, Moon Jae-in. Following the meeting, Xi said that “both China and the DPRK (North Korea, or the Democratic People’s Republic of Korea) are socialist countries, and their bilateral relations are of major strategic significance,” as quoted by Xinhua. Kim also praised his relationship with Xi as having a “comradely trust” and said that he looks forward to continuing to work together. Kim also reportedly briefed Xi on the latest developments and decisions in the Workers Party of Korea (WPK), North Korea’s ruling party. Xi said after the meeting that the most recent congress of the WPK’s Central Committee had developed a strategy of focusing on “socialist economic construction,” and raising people’s livelihood. The latest meeting precedes an expected meeting between Kim and U.S. President Donald Trump in the coming weeks, the outcome of which could have major consequences for the region, and potentially end the Korean War that has continued since 1953.